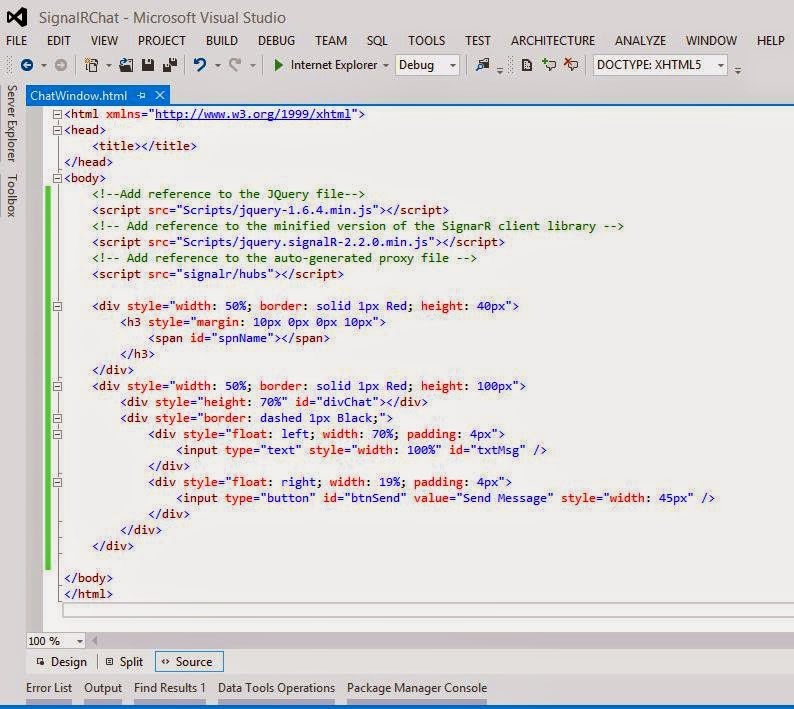 ASP.Net SignalR is one of the major revolution in the development technology world these days. Consider an application having a page where you are required to update the user interface with the latest data, as soon as it is available. Such applications are said to be real time applications, where the UI gets updated as soon as the latest data is available for the user. Best example, a stock market application has to keep updating the user interface with the data as soon as stock rates are changed. Another example is a chat application, which updates the receiver with the latest message, from the sender. Some of the techniques could be making timer based requests to the server, for getting the data or use the concept of polling to get the data. 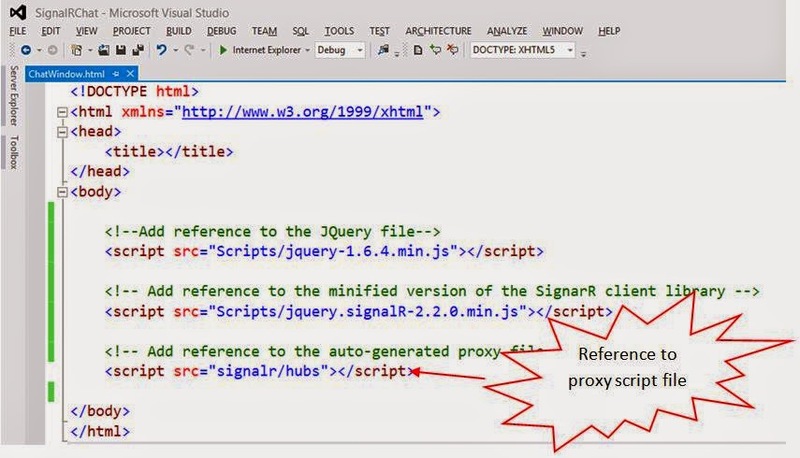 A good alternative to these, is the use of SignalR. One very important point from the above paragraph is that the client never calls the hub for getting the latest data. Client may only call the hub so that hub can forward the message to the other connected clients. 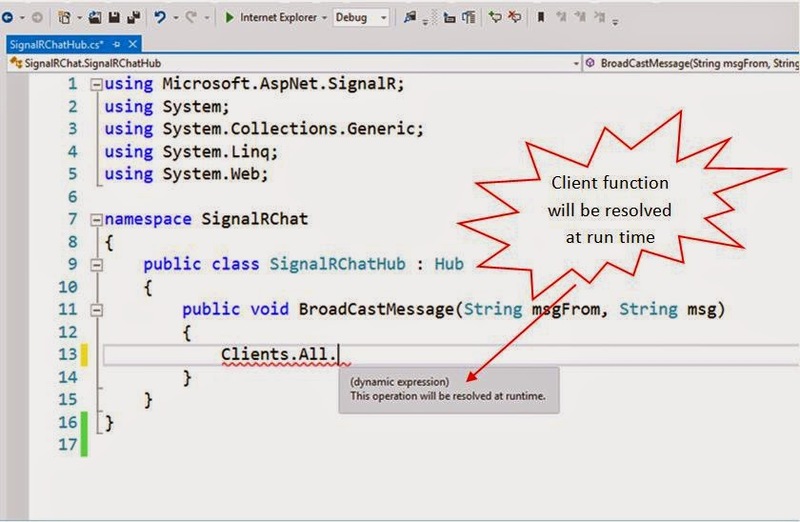 If the client code would need to make the calls for latest data to the server, than the whole purpose of using the SignalR fails and we could have used the old concepts of timer or page refresh for this. Yes, that's correct. 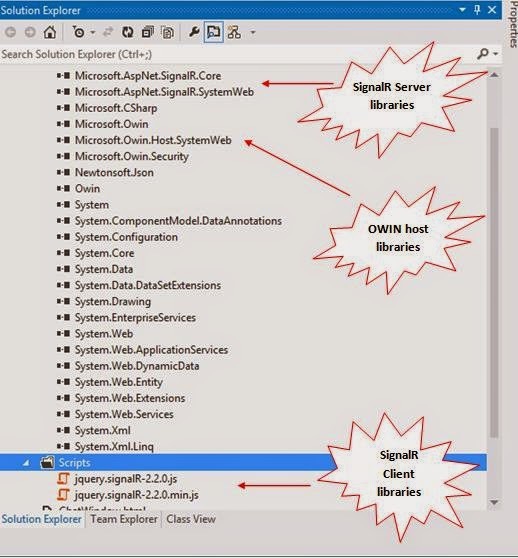 Once you are aware of the basic concept/flow of SignalR, you can do it very easily. We will be now creating a group chat, without use of any database. 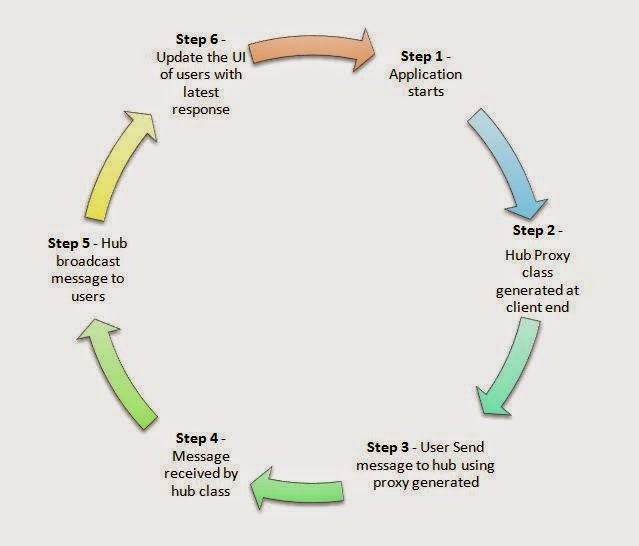 If we think about the flow of the application, this whole process requires a client to send message to the server, which will broadcast this message to the all the connected client users. So the server needs to have a component which can broadcast the message to the clients. This role is played by the hub class. 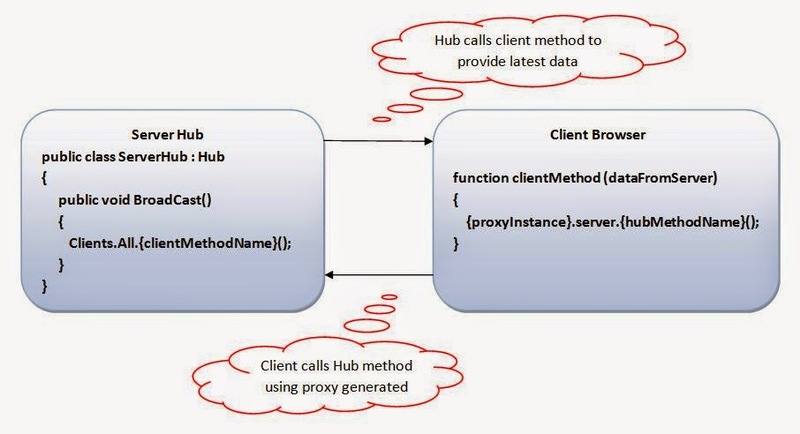 This is the example, where the client needs to call the server hub. Let's try to visualize this process and than we will create the application. We will be using the OWIN based hosting, to host this application. Without going into depth of the OWIN hosting, let's add a class named Startup.cs. The name has to be the Startup as per the OWIN based hosting specifications and its namespace must be decorated with the assembly attribute, specifying that Startup assembly is the starting point of the application. 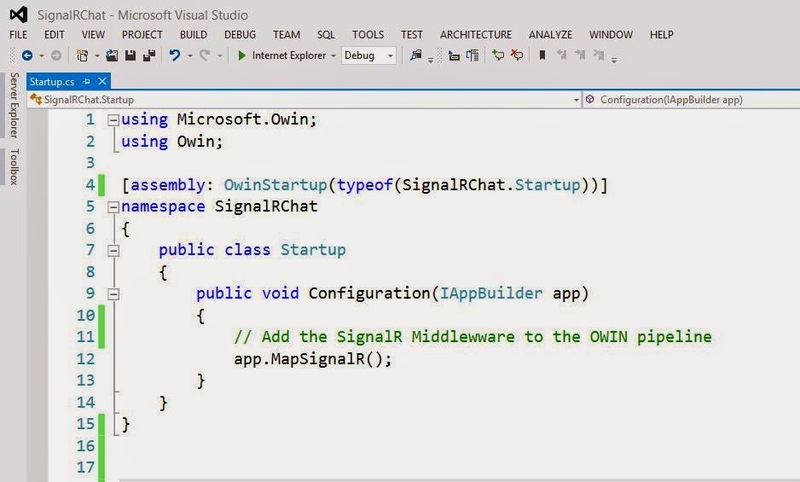 Next we define a method named Configuration and register the SignalR in the OWIN pipeline using app.MapSignalR(). So we need to add this reference also. 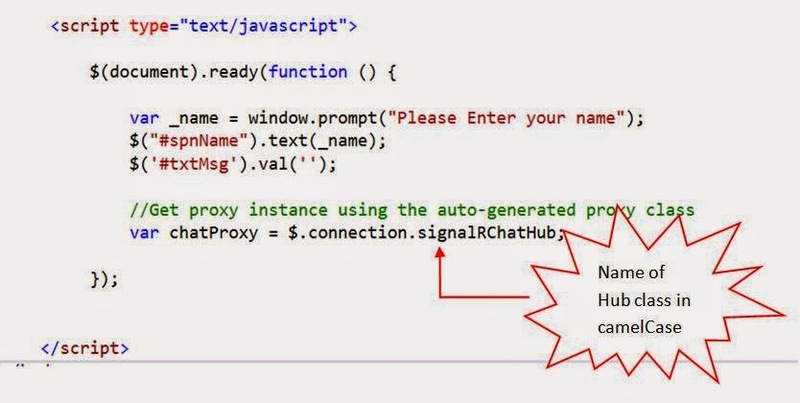 We also have the option to disable this auto-generated proxy file generation (which is out of scope for this discussion) and create the proxy ourselves. In that case, we need to reference that file accordingly. 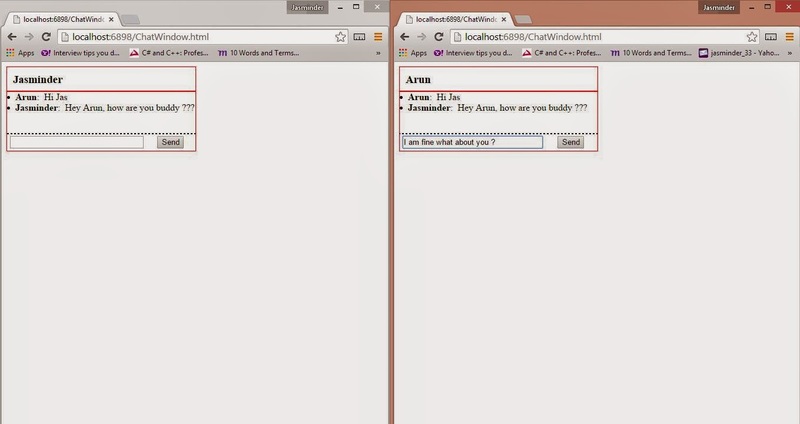 Next, let's add some html mark-up to generate the chat window and design it using css styling. 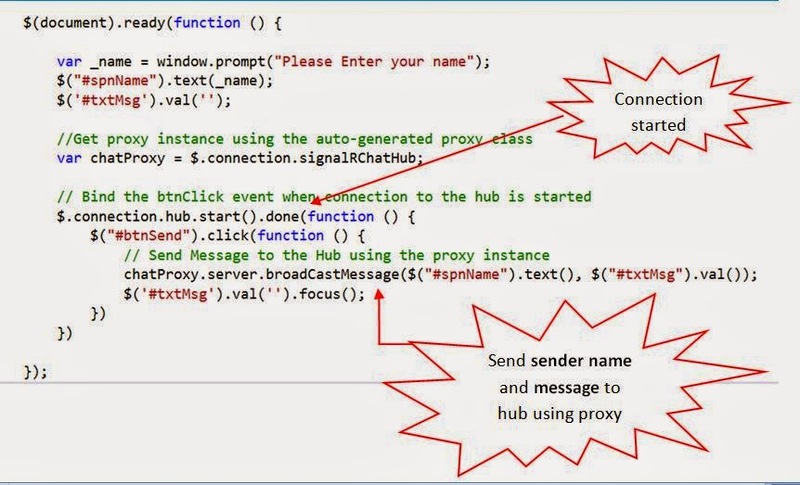 Now its time for client code to connect with the hub and send the message, so that hub can broadcast to all the users. 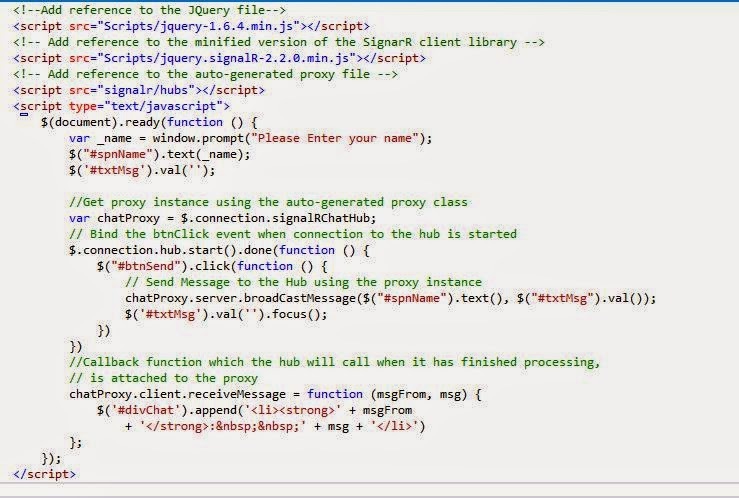 For this, we first get the proxy instance in a variable named chatProxy.Note the camel case syntax of the client code below. 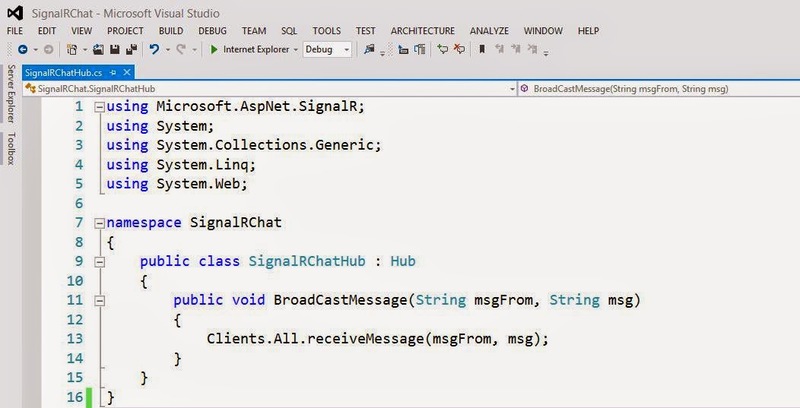 This is the convention to be followed while creating the SignalR application. For detailed specifications, I would recommend you to check out the asp.net official SignalR website. Without going further into the details, let's move forward with the code. Here, signalRChatHub is the name of the hub on the server (that we created on the server earlier). We also declare the function to which the hub will call, when it needs to update all the users with the message received. This is the function name we referred to, from the hub method, at the start of the discussion. So this function acts as a type of callback function here. Now we can run the application. Copy the url and open another instance of the browser or any other browser and we can start chatting. Wasn't that easy ? So we have our own chat messenger. Happy coding...!!! can you pleas Attach the source files? Ofcourse you should be able to make it as separate project. There should not be any issue with this.